Meet Winthrop Orthodontist | Julianne C. Doyle, DMD | Brooks Dental, P.C. As a resident of Winthrop, Dr. Julianne Doyle values providing an exceptional level of patient care to her community. She uses the latest advances and innovative techniques to ensure that her patients receive the highest quality of results with minimal treatment time and little discomfort. Dr. Doyle grew up in north central Florida and graduated from the University of Florida with a Bachelor of Science in Nutrition. She came to Boston to attend the Boston University Henry M. Goldman School of Dental Medicine, where she received her Doctorate of Dental Medicine. It was during this time that Dr. Doyle was selected into the prestigious Omicron Kappa Upsilon National Dental Honor Society. 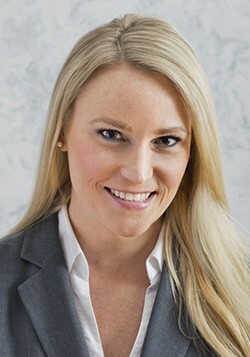 After dental school, Dr. Doyle completed a three-year orthodontic residency at BU earning her Certificate in Advanced Graduate Studies and a Master of Science for her research relating to the airway and airway disorders such as sleep apnea. She gained additional experience in orthodontics after completing a one-year clinical orthodontic fellowship at the University of Florida College of Dentistry. She is Invisalign certified and is a member of the American Association of Orthodontics, the American Dental Association, the Northeastern Society of Orthodontists, and the Massachusetts Dental Society. Outside the dental office, Dr. Doyle enjoys living a healthy and active lifestyle. She is an avid foodie and enjoys learning new culinary techniques. She has always had a passion for both music and sports, especially college football. Dr. Doyle regularly enjoys attending Red Sox, Patriots, and Bruins games to support our local teams.